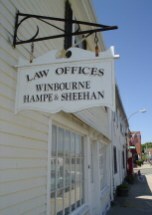 At Winbourne, Hampe & Sheehan, a law office in Dedham, Massachusetts, our mission is to learn and understand our clients' needs and the external factors affecting them so that we may aggressively and professionally represent them throughout the legal process. We strive to communicate our legal knowledge and experience to enable our clients to make well-informed decisions for themselves. With a wide-range of expertise, our attorneys concentrate in the areas of Estate Planning (wills, trusts, durable powers of attorney, health care proxies), Probate Law (estate settlement, guardianships, conservatorships), Elder Law (Medicaid, MassHealth and nursing home planning), real estate, municipal law, mental health law and criminal law. Our approach is to provide a personalized attorney-client relationship based on each client's unique concerns and requirements. Our philosophy is based on our commitment to provide experienced advice to our clients, during times when legal advice regarding important life issues, i.e., home purchases and sales, retirement, illness, death, etc when needed. Our clients can expect prompt personal service and quality legal representation delivered in a cost-effective manner. At Winbourne, Hampe & Sheehan, we constantly seek to improve our performance in order to be prepared for the challenges facing our clients. Our work environment is based on diligent work effort, community involvement and a commitment to the profession.